William Hill is one of the biggest and most recognised names in sports betting, with a history dating all the way back to 1934. But how does this gambling giant square up to the modern age of online gambling and esports betting? 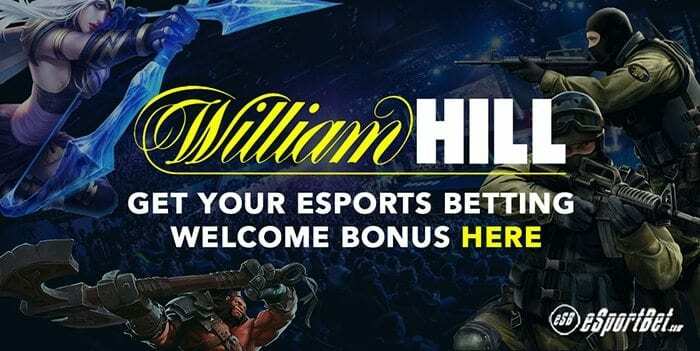 We check out William Hill’s esports betting markets and suss the deposit options, welcome bonuses, security and customer service options to see why this is a top-rated site for real money esports wagering. Note: These bonus offers may change at any time, and are subject to terms and conditions including certain wagering requirements that must be met before any winnings made from bonus money can be withdrawn. We strongly advise you read the fine print of any bonus offer before depositing real money to ensure you understand your requirements. William Hill uses a layout that is very similar to most other online sports betting sites, so while you shouldn’t expect anything special from this site, it does offer a solid platform to place real money bets on a range of events. If you don’t want to get bogged down with all the other sports and racing stuff, just go straight to the esports category (listed down the left-hand side of the homepage) and ignore the rest. The mobile site offers the option of placing bets directly over your Web browser, or by downloading the exclusive William Hill mobile app. The mobile site can be a little clunky to navigate at first, but you’ll find esports events in the drop down menu by tapping on ‘Sports’, then ‘All Sports’ and then scrolling through the alphabetical list until you come across the esports category. The mobile site has the same esports offering as the desktop site, which is a plus as we’ve seen some lesser-known bookies offer less options for mobile punters. William Hill’s esports betting market covers the most in-demand and popular esports, but the betting options are pretty stock-standard, with none of the exotic markets you’ll find at rival betting sites like Bet365 or BetEasy. William Hill only offers straight bets, which is where you bet on who you think will be the winner of the match (also called match winner, head-to-head or money line bets depending on your location). You have the option of betting on ‘Match’ bets or ‘Futures’ bets. Match bets are where you place wagers on individual matches and qualifier rounds, whereas Futures bets are wagers placed on the winner of the entire tournament. We expect that William Hill will start adding more esports betting options and prop markets as the esports industry continues to grow, but until then you will find more comprehensive betting markets offered elsewhere. Read our reviews of Bet365 and BetEasy to see what other more detailed esports betting markets are available. William Hill also offers some fun novelty betting markets, where punters can place wagers on the outcome of certain political campaigns, entertainment industry events and TV show outcomes. We’ve seen some pretty bizarre betting markets here (for example, the chance to bet on who will die next in the Netflix series Stranger Things) so the Entertainment category is worth checking out for curiosity sake. The best way to know what payment options are available for you is to head directly to the William Hill website and view the list of deposit options displayed at the bottom of the homepage, or check in the FAQ section. In terms of the esports selection, William Hill offers a good betting platform, with markets for all major games including Counter Strike: GO, LoL, Dota 2, Hearthstone and Heroes of the Storm, but the betting options are very straightforward, with Match and Futures bets on winners only. If you’re happy with that, then William Hill offers a safe, reputable and secure venue to place real money esports bets online, with instant deposit methods to suit all players.